This sample is still available if you missed it before. Request a free Shout Color Catcher sample. With Color Catcher® you can mix whites, lights and colors without worrying about color runs. No need to separate clothes by color! Color Catcher® traps loose dyes and dirt released during the wash cycle. 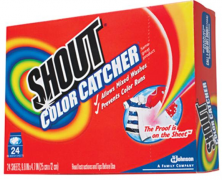 At the end of the wash, the dye and dirt come out on the Color Catcher® sheet, not your clothes.